Outdoor markets in Florence are extremely popular with the locals. Shopping at street markets has always been a long-standing part of the Italian lifestyle, and things are no different today. I think it's because Italians, and Florentines especially, love to interact with others no matter what else they are doing, and Florence markets are such a hubbub of social activity. Stalls are usually run by two or three owners, and often friends in the area come to hang out and chat with their market worker friends (I know what I'm talking about because my first job in Florence over 20 years ago was at a stall at San Lorenzo!). Then, you'll see people at the nearby coffee shops who keep popping in and out to bring a coffee or drink to one of the stand workers - it's really one big market family when the stalls are out! Outdoor markets in Florence can be divided into two categories though: markets for mostly locals and markets that are frequented mostly by tourists. The San Lorenzo market is Florence’s most well-known and most central outdoor market. This market probably has the vastest assortment of all types of articles: clothing, leather goods, souvenirs, scarves, shoes, stationery stands, ceramics and more. San Lorenzo is very popular with tourists who make up most of the clientele, but is also frequented by some locals. 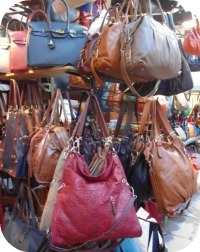 There are a huge amount of leather jacket stalls and also leather jacket shops along the neighboring streets which make San Lorenzo one of the favorite places for tourists to shop for a leather jacket. One advantage of shopping at San Lorenzo is that there are so many stalls that the competition is tough and stand owners keep prices down as much as possible. One thing I do want to mention though is that the majority of the stands at San Lorenzo are no longer operated by Italians. So, while the goods may still be made-in-Italy (or may not be! make sure you read the labels...) the person selling to you probably won't be a native Florentine. 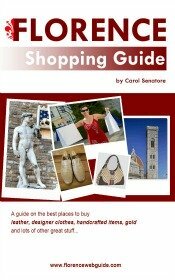 Some people feel that this has caused the San Lorenzo market to lose its local authenticity and makes for a less genuine Florence market experience. Lastly, I also want to mention that right near the market, inside the 18th century building which has its main entrance in Piazza del Mercato Centrale, there is a very popular food market where locals who live centrally do their shopping (closes at 2 pm). Here you can find some wonderful food stands that offer typical Florentine foods at good prices. 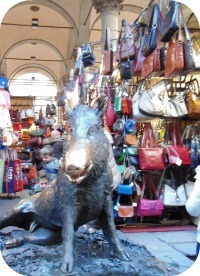 The Porcellino market (aka ‘Mercato Nuovo’, the New Market) is most famous for its bronze fountain of a wild boar that dates back to the 1640’s. Legend goes that if you make a wish and rub the animal’s nose while putting a coin in its mouth your wish will come true. This market is held under a loggia that goes back to the 1500’s when it was built for the local silk and straw merchants. Today the market sells very similar items to the San Lorenzo market but is much smaller. The Porcellino market is more frequented by tourists than locals, also because it is located just along the street going to the Ponte Vecchio, one of the most popular tourist stops. The market covers a small area, just the one small square, so the selection of goods is small: mostly leather jackets (also kiddie sizes!) bags and wallets, scarves, and tapestries are the main items. 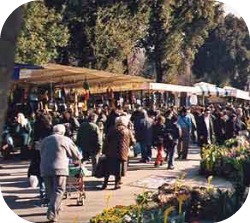 The Cascine market is the street market in Florence that is most popular with locals. 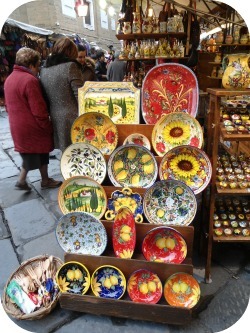 Goods at the market are not aimed at tourists (ie no souvenir stalls) but at a steady clientele of Florentine residents. This makes the Cascine market a great choice if you want an authentic local shopping experience at Florence outdoor markets. 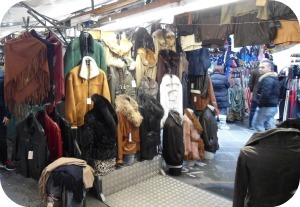 The market sells clothing, shoes, houseware, linens, undergarments and sleepwear, cds and more. There are also lots of stands with foodstuff, cheeses, breads, cold cuts, fruits and vegetables. 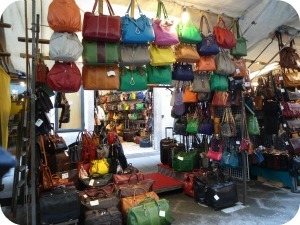 The Fortezza da Basso is a true flea market in the traditional sense of the term. 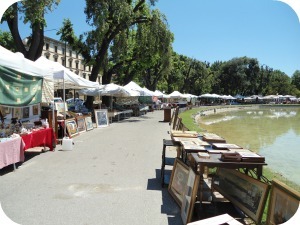 Located in a huge piazza with a fountain and large pond in the middle, the market stalls are situated all around the circular square under the shady trees. Nearly all of the stalls at the Fortezza market are operated by locals and the clientele too is made up of mostly Florence residents. Not many tourists know about this market and those who come here tend to be people who just happened to stumble upon the market while passing by. If you enjoy hunting through vintage items at flea markets looking for a great find, you'll love the Fortezza market. 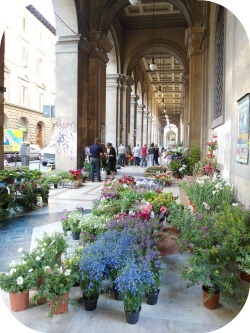 The Florence flower market is a lovely street market which extends the length of the beautiful portico just near piazza Repubblica. There’s a large selection of flowers and plants as well as seeds and other gardening items. Even if you are not planning on buying flowers (although I'm sure your girlfriend wouldn't mind! ), this market is a very pretty and peaceful stroll right off one of Florence's main squares.